If you have ever wanted to grow sweet potatoes but were unable to find rooted slips, it is because almost all mail order catalogs are unable to ship sweet potato plants to California due to quarantine of southern grown slips. A source, however, was found for slips from a sweet potato grower in Merced County, and the five varieties listed below were grown in the vegetable demonstration garden at the Fair Oaks Horticulture Center during the summer of 2013. ‘Japanese’ – Heirloom variety, early, vining. 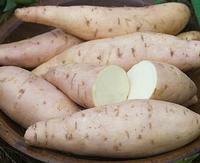 ‘Japanese’ sweet potatoes are rose-skinned, white-fleshed, and drier than what most of us are used to. ‘O’Henry’ – Yellow skin and white flesh with a unique flavor reminiscent of nuts and honey. 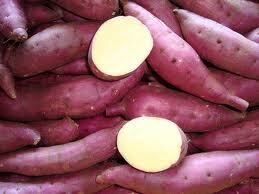 ‘O’Henry’ is slightly drier than other sweet potatoes and bakes up perfectly. ‘Bonita’ – Tan skin with a pink cast at harvest; pink fades to tan after storage. The white flesh is dry and sweet. Demonstrates superior disease resistance to southern root-knot nematode and has a mid to late growing season. The sugar content is double that of ‘O’Henry’ and has a slightly sweet flavor. Reportedly has a high yield. The sweet potato slips (rooted cuttings) were planted in a 3-by-8-foot raised bed on May 15, 2013. Sweet potato plants need 3 to 4 months of warm summer heat before they are ready to harvest, so they were not harvested until September 28 and October 3, 2013. Because the vines can take up quite a bit of space, they were trained up a trellis constructed of a 4-by-7-foot sheet of concrete reinforcing wire attached to steel T-posts. The plants were irrigated by three rows of drip irrigation lines with .9 gallon per hour in-line emitters spaced every 12 inches. Because the raised beds contain sandy loam soil that drains fairly quickly, during the heat of summer the irrigation ran for 30 minutes three times per week. The raised bed was mulched thickly with straw to reduce the growth of weeds and to help retain moisture in the soil. The vines grew rapidly up the trellis and did not exhibit any problems with pests or diseases. While not all sweet potato vines flower, several of the vines had pale purple blooms that looked like morning glory flowers. 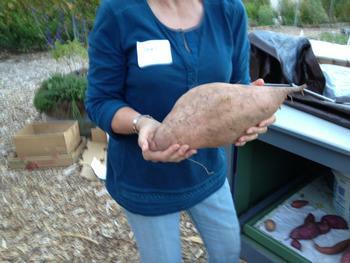 Harvest Results: A total of slightly over 51 pounds of sweet potatoes were harvested from the five plants. 'Japanese' was the winner with 15¼ pounds, followed by 10½ pounds each from 'Bonita' and 'Covington'. 'O'Henry' had a yield of 9 pounds, and 'Diane' had a yield of 6 pounds. 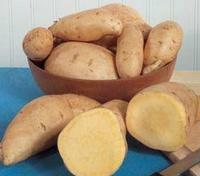 There were a variety of sizes and shapes of sweet potatoes that were harvested, with a 5-pounder from 'Bonita' and a 6-pound 'Japanese' sweet potato. Curing the sweet potatoes for storage posed a bit of a challenge. Freshly harvested sweet potatoes are not very sweet, so they need to be cured for 1 to 2 months before they develop a sweet flavor and will be in good condition for long-term storage. We followed some of the suggestions set out in the information about growing sweet potatoes in the Sacramento area (see link below) and were successful in curing the sweet potatoes. Many of them held in storage for over 5 months. This was our first attempt at growing sweet potatoes, and we discovered that they are easy to grow and provided a good harvest of delicious sweet potatoes. 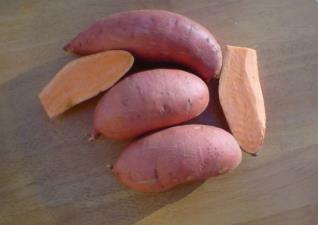 For more information about growing sweet potatoes in the Sacramento area, download EHN 102 (PDF).